Oh, yeah, she’s a looker. Those ruby red crimson stalks, sporting that deep green floppy hat, well you just have to do a double take. She’s like celery with lipstick or Swiss chard with better legs. Rhubarb is sweet as pie, but without enough sugar she can really make you pucker. Oh, Rhuby, you make us crazy for spring. Salty’s pastry chefs serve you Rhubarb Tarte Tatin in April, and if you can’t make it in, try our home-cook’s recipe. 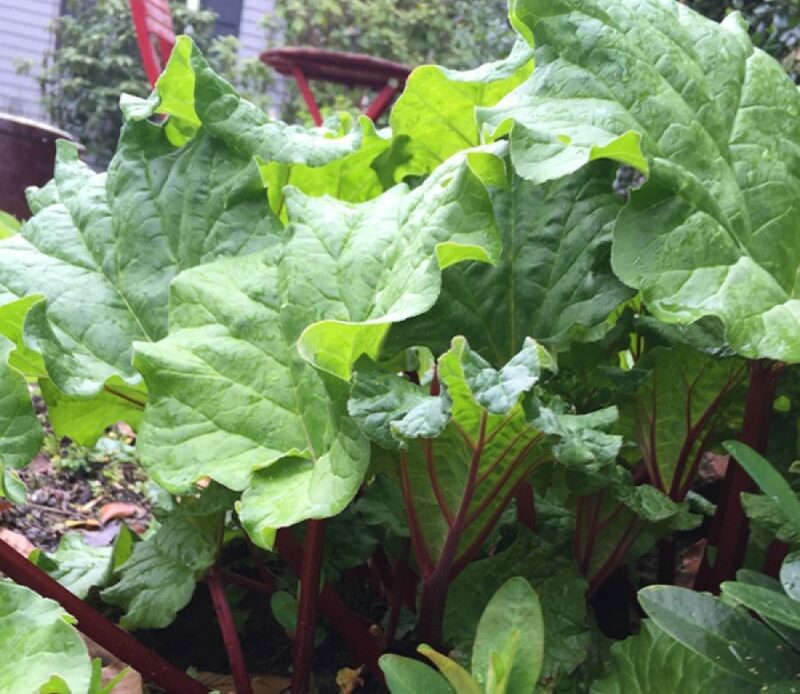 This may shock you, but when it comes to vegetables, little miss Rhubarb technically IS one. Oh, she didn’t tell you? With all her talent she did NOT want to be limited just to the savory. So she went before congress in 1947 to declare that, with her beauty and dessert-making capabilities, she should also be considered a fruit. Well they agreed and guess what, she is fabulous as an ingredient either way. In fact, Chef Jeremy’s Rhubarb Chutney recipe with both sweet and savory combined is proof positive of her vibrant versatility. Rhuby is the queen of contradiction. Her delicious, good-for-you stalks can grow the deepest scarlet red or the freshest verdant green; either way their flavor is delicious. However, stay away from her showy-chic leaves. They are a big “No, No!” The high oxalic acid content in them makes them absolutely toxic! Rhubarb is also high in fiber, and very low in calories. This makes her a great addition to our spring repertoire. After all, isn’t bathing-suit season right around the corner? In addition, her high antioxidant polyphenol content is great for cardiovascular health and all diseases inflammatory, like Alzheimer’s, arthritis and cancer. In fact recent research has found that she may have a key role to play in the fight against cancer. A study from Great Britain indicated that twenty minutes of baking British garden rhubarb increased its levels of anti-cancerous chemicals. My, what a talent she is! So I say, warm, cold, sweet, tart or savory — go ahead and pucker up for Rhuby. Salty’s pastry chefs serve you Rhubarb Tarte Tatin in April, and if you can’t make it in, try our home-cook’s recipe.